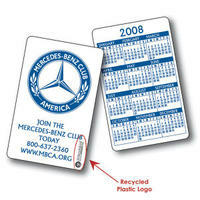 Our calendar cards are a perfect way to keep your name and logo in front of your customers. We can imprint the name of your company, the logo and your contact information on one side and the calendar on the other. These business cards are traditional credit card size and thickness. They’re ideal for sales representatives, mortgage brokers and real estate agents. Our calendar cards are available in 4-color process front and back. We even have stock calendars available.